Going beyond our technologically advanced components and space saving design, a large part of our job at IntelliFinishing is working with our customers to solve their problems and challenges. There are usually a few key hurdles that lead a customer to consider purchasing a system or renovating their existing setup. As part of a four part series, we will look at the specific challenges one of our recent customers faced, and the solutions provided by IntelliFinishing. The third goal for our customer was to reduce energy consumption and eliminate waste as much as possible. 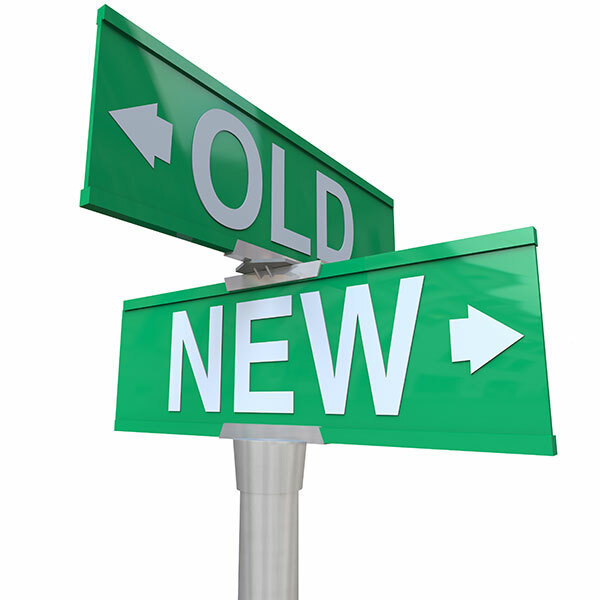 This makes sense, as energy rates continue to rise and the emphasis on lean and green continues to grow. As we promote so often at IntelliFinishing, independent studies have shown that our unique chainless power and free conveyor can save over 40% on utility bills when compared to the antiquated monument systems. This held true for this project as well, but there were other innovations that helped as well. Simply replacing the 6 open-faced paint booths with a single automated booth went a long way in reducing energy use on the booths themselves, as well as the air handling units used to condition air going into and air being exhausted from the paint line. Our conveyor line is also decoupled, allowing each drive section to operate independently, only running when a carrier is present. The same could be said for the process washer as well. So while a monument system may have two or three large motors pulling chain continuously, the IntelliFinishing system breaks our conveyor down into much smaller sections that are controlled by much smaller variable speed drives. In this way, more motors does not equate to greater electricity usage, but actually reduced demands and added great flexibility. The process equipment used in IntelliFinishing systems is also a step above the industry norm. Our oven and washer panels are insulated to help keep chemical tanks and curing chambers at temperature. On average this makes our process equipment 75-80% more energy efficient. 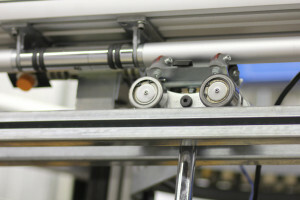 Automated product doors also help to prevent heat loss. As a side note, the insulated ovens we incorporate in our systems also prevent accidental burns of employees. Even running at temperature, you can place your hand on the sidewall. Another challenge at the top of our customer’s needs was creating a safe work environment. With their existing manual system, the physical demand on the operators of lifting and loading parts through the various processes was excessive. The existing system was also very loud and difficult to keep clean with the several open-faced paint booths used to coat their parts. Again, IntelliFinishing was able to incorporate several pieces of equipment into the system that all worked together seamlessly for a safe, quiet, and productive paint line. The first step was adding a lowerator to assist the operators in racking parts. The lowerator takes a carrier from the height of the process equipment down directly to the parts. This makes loading much easier, especially on heavier parts, and prevents stretching or straining when loading or unloading. To limit chemical exposure to the operators, a multi-stage automated washer was added to improve the efficiency of chemical use and provide controlled containment of the chemicals as well. By reducing the overall usage of the chemicals our customer also reduced their chemical emissions to the environment, which was an added benefit. Though I suppose he may have been talking about us children. 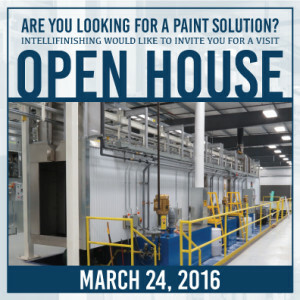 Contact us today to find out how we can make your paint operations safer, quieter, and more efficient. The first concern for our customer was how they were going to replace their existing manual paint shop with an automated, state-of-the-art IntelliFinishing system in the same space, which only measured 74 feet across and 55 feet deep. IntelliFinishing’s solution to this challenge was to make use of our unique conveyor design that allows our product carriers to flow forwards and backwards, independent of other carriers in the system. This allowed us to “dead head” or “spur” into areas like an inspection platform and a washer to reduce space. In the curing oven we used our variable speed drives to speed up or slow down dwell times based on the part recipe. This, along with in-depth part tracking, allowed our curing oven to be much smaller in size, while allowing the wide range of flexibility required by the variety of parts being coated. 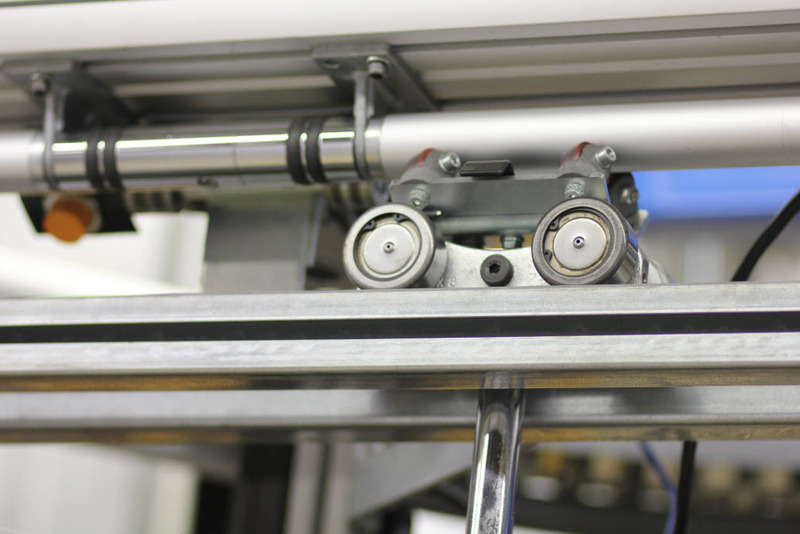 Finally, since our system is truly decoupled, we could incorporate short motor breaks for inspection and masking areas without affecting the effective line speed throughout the rest of the system. As a result of our innovative equipment and controls, IntelliFinishing was able to successfully design a system that met all of the customer’s goals while not exceeding the 4,000 square foot area of the outdated manual system. Find out how our use of shuttles and lowerators can reduce your system footprint while maintaining or exceeding your expectations for performance and flexibility!